SyncToy is a great tool to help you keep your files and folders synced between drives and devices. Here’s how you can make it do sync automatically so your files will stay synced even if you forget to sync them. By default, SyncToy only synchronizes your files when you run the program and directly tell it to sync. This might work fine for syncing files to a flash drive before heading out on a trip, but makes it difficult if you’re using it to synchronize files regularly between folders or drives on your computer or with Dropbox. 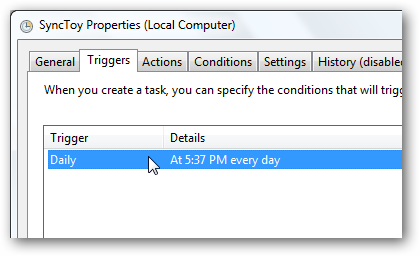 Windows includes an often overlooked scheduling tool that can automatically run many applications without any action on your part. 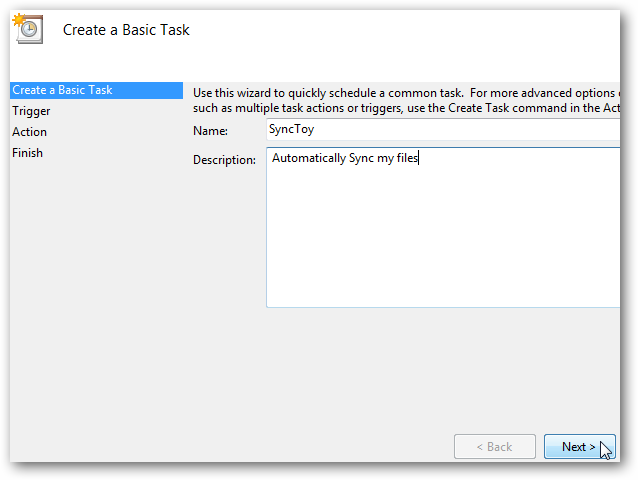 Let’s see how you can setup SyncToy to automatically sync with the Task Scheduler. First, make sure you have SyncToy installed and have some syncs setup. 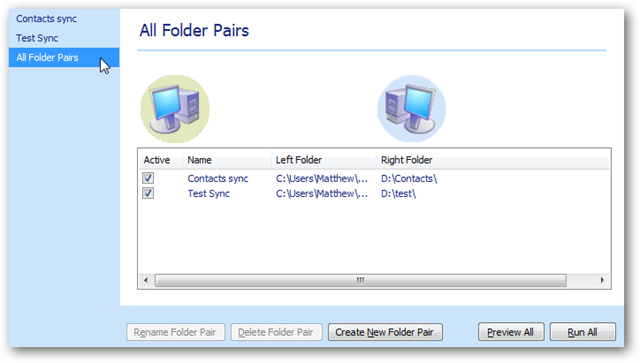 Here’s one of our articles with more info about Synchronizing Folders With SyncToy. 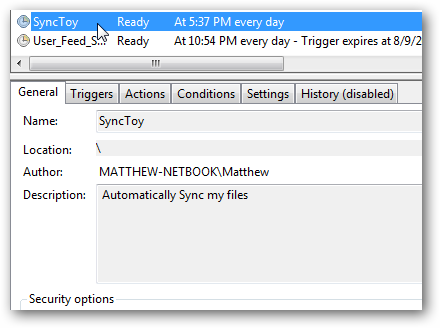 Now open Task Scheduler to get SyncToy automatically syncing. 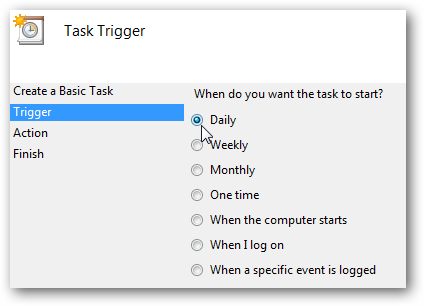 Type Task Scheduler in the Search box in the Start Menu and hit Enter. Once Task Scheduler opens, click Create Basic Task on the right sidebar. 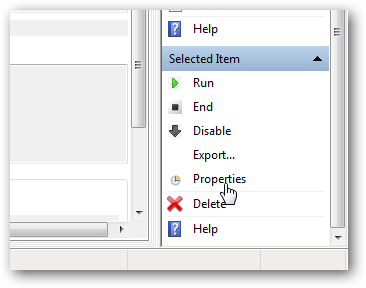 Enter a name and a description for your task in the dialog that opens so you’ll be able to easily recognize your task. Choose how often you want to run the task. Note that Daily is the most frequent you can select in the dialog, but we can tweak this later in the settings. Click Next to continue. You’ll be asked to add additional settings depending on the trigger you selected previously. If you chose Daily, then the default settings should work fine. Note that it will automatically run daily at the current time; if you’d rather it run at a different time, enter the time you’d like in the box. 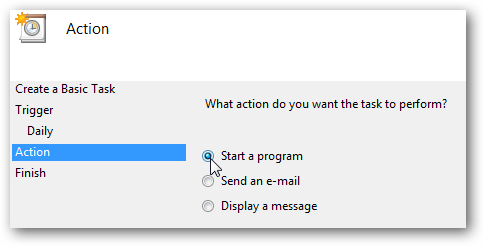 Now, you’ll be asked what you want the action to do…Click Start a program. Then, in the Add arguments box, enter –R to run all of your syncs each time. Alternately, if you’d only like to run one of your syncs, enter –R “your sync name”. Make sure to enter the sync name inside quotes if it contains any spaces. Once you’re finished, click Next to continue. If you left out the quotes in the program’s field, Task Scheduler will ask if you want to run C:\Program with the remainder as an argument. Click No to keep it like you entered, and Task Scheduler will add the quotes correctly for you. You’re finally finished. 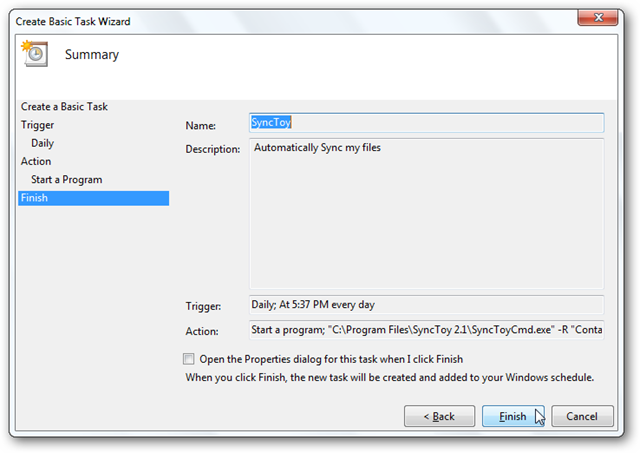 The Wizard will show you a summary of the sync settings; click Finish to save the changes. Now your sync will automatically run as you set, and you’ll never have to worry about running it manually again! If you’d like to make your files sync more often or change other things about your task, you can easily do so from the Task Schedule interface. 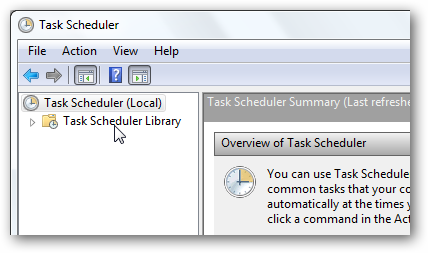 Click on the Task Scheduler Library on the left side to find your task. Scroll through the tasks listed, and find the one you created previously. You’ll see an overview of its settings in the preview underneath. On the right sidebar, click Properties to change its settings. To change how frequently it syncs, click the Triggers tab and double-click on your time listed. Now you can select to have it repeat the task every hour or any other time you want, for as long as you want. This dialog is much more flexible than the previous one used when creating the task. 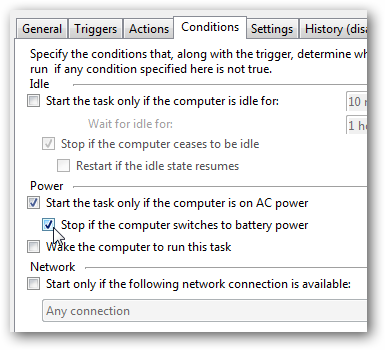 Back in the Properties dialog, the Conditions tab lets you choose whether or not to run this task when your computer is running on battery power if you’re using a laptop/netbook. By default it will only run when on AC power, but you can uncheck the box if you’d rather it sync even if you’re on battery. 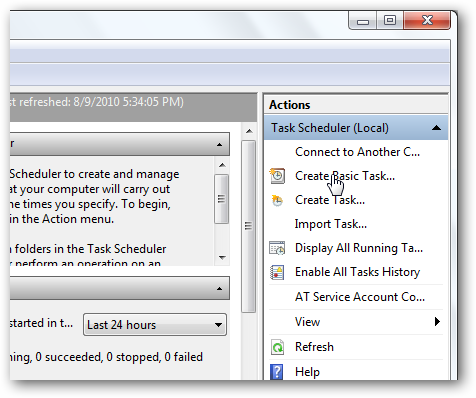 You can also go ahead and run the task manually from the Task Scheduler if you’d like. You may notice a command prompt window open while the sync is running, but it won’t require any input from you. No matter what you need to sync, SyncToy is a handy tool to make sure all of your files are kept in different locations. 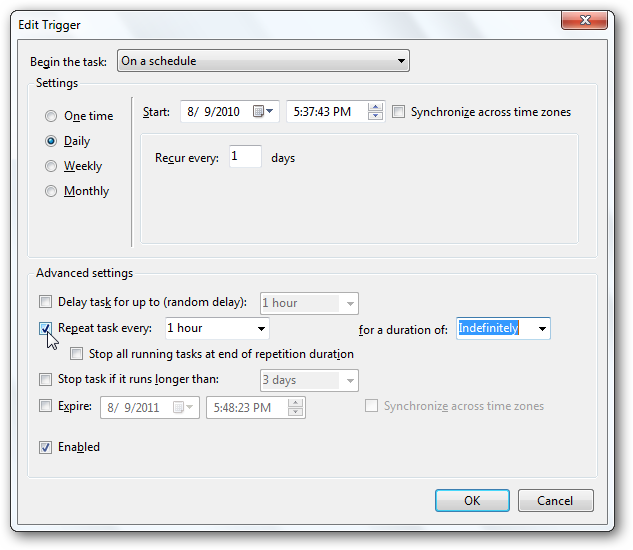 You can run as many syncs as you want automatically with the Task Scheduler, freeing you up for more important tasks. If you haven’t already looked at it, check out our article on how to Sync Any Folder to Dropbox With SyncToy. Once you’ve got that setup, you can automate your Dropbox syncs this way, too!